Bangalore-based Manta Ray Comics is an independent publishing company that aims to tell different stories, and to tell stories differently. 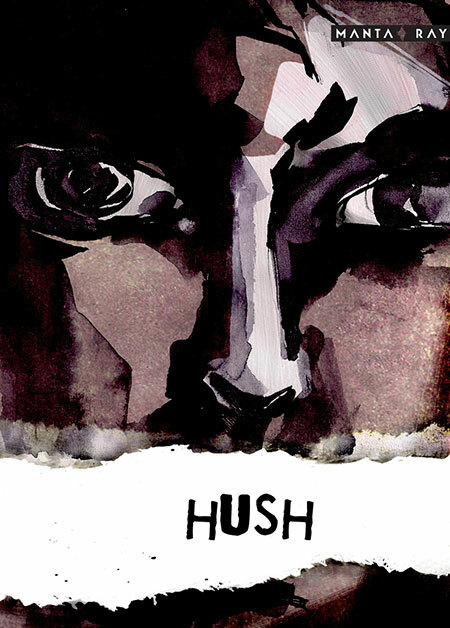 With their debut graphic novel, the critically-acclaimed Hush, they’ve successfully attempted to push the boundaries of the Great Indian Graphic Novel. We caught up with founder Pratheek Thomas for a brief chat about Hush, their upcoming release Twelve, and their plans for the near future. 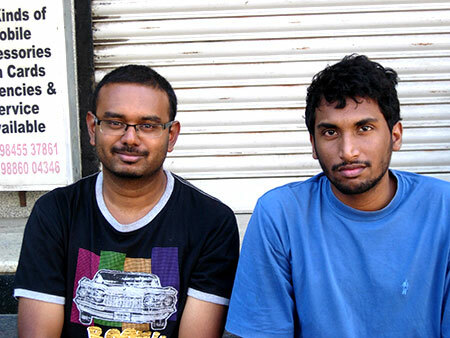 Pratheek Thomas and Rajiv Eipe, creators of Hush. When did you start Manta Ray Comics? How did the idea come about? The origins of Manta Ray lie in the creation of Hush. In March 2009, I was speaking with Rajiv [Eipe] about adapting my brother’s short film idea into a short, silent comic story, which eventually became Hush. The idea then was to bring out Hush in a complete do-it-yourself style: take Xerox copies and put them up at local bookstores in Bangalore, just to see how people would respond to it. Around the same time, my friend Dileep [Cherian] asked me what I was up to those days, and I told him about Hush. He was really excited about the idea and proposed that we start a publishing house together to bring out comics and graphic novels in India. From that discussion, Manta Ray happened. I think both Dileep and I have always wanted to start something of our own, though we never knew we would come together to do it. We’re both aspiring storytellers and writers. We love stories; we want to tell our own stories. So I guess it was all about timing—Vivek telling me his story idea, Rajiv and I coming together to make Hush, and Dileep asking me about Hush—it just came together at the right time. With your debut publication Hush, you said that you wanted to “challenge certain notions about what a comic is, about what it can do and should do”. How far do you think you’ve succeeded? From a publisher point of view, I think we’ve definitely challenged the notions of what comics can do. We’ve told a story which deals with a subject that is rarely talked about in the mainstream media or entertainment channels, and we did it through just pictures and no words. And while the story is not entirely new (in terms of the subject matter it speaks about), it still manages to be hard hitting and relevant. As a story, it has many layers to it, which emerge only over multiple readings, which is something our readers really liked and appreciated. Added to this is the response the book has got from the readers, magazines, N.G.O.s, and newspapers in India—I’d say we have succeeded in what we set out to do. Hush is markedly different from other Indian comics in its style and theme. The comic has been acknowledged as a breakthrough in Indian comics. It’s a great feeling to know that ‘different’ comics too have a readership in India. Some of our close friends weren’t sure if Hush would find a market in India, they felt it was too dark, etc., but now we all know that it was a risk worth taking. We knew from the beginning that we could tell different stories—that’s what we want to do. We were also sure of the efforts we put into Hush, be it in the storytelling, Rajiv’s brilliant artwork, or the production quality of the book—and it has all paid off. But this is just the start. Our real test will be the stories that we tell from here. What do you think of other artists in India like George Mathen (Appupen) who have also created silent comics? George’s Moonward was selected for the Angoueleme Comics Festival this year, which is like the Cannes or Oscars of the comic book world, and that’s an amazing achievement. I think Moonward was produced really well too. What is your opinion of the current state of comics in India? There seems to be an increase in readership and renewed excitement in the medium, and a host of new comics publishers and artists. Now, there are also annual events like Comic Con India that promote comics in the country. There’s definitely a resurgence in comics in India and it’s great to be a part of it. Like you said, a lot of new publishers, creators, and artists are coming out, which is really good because it only helps popularise the medium and bring more readers to it. The Delhi Comic Con early this year was a great experience—we didn’t expect that kind of a response for the event or for Hush. All the copies we carried was sold out at the event, and the organisers think Hush was the number one seller there, which is amazing for an experimental comic! And now they’re having a second edition in Mumbai, where there is a huge comic readership too. So it is an exciting time to be a comic book publisher in India now. Another interesting thing is that while the established players—HarperCollins, Penguin—are bringing out the graphic novels, the new players, such as Vimanika, Level 10, and Holy Cow are trying out the monthly series format. There seems to be a readership for both these formats, which is good news, because we want to do both. Hush was a mini graphic novel, while our upcoming set of stories—Twelve—is a monthly series. At the same time we’re coming across interesting graphic novel proposals from independent creators, and we’d definitely like to work with some of them. Could you tell us a little more about Twelve, your upcoming collection of graphic short stories? What can readers expect from it? When will it be released? 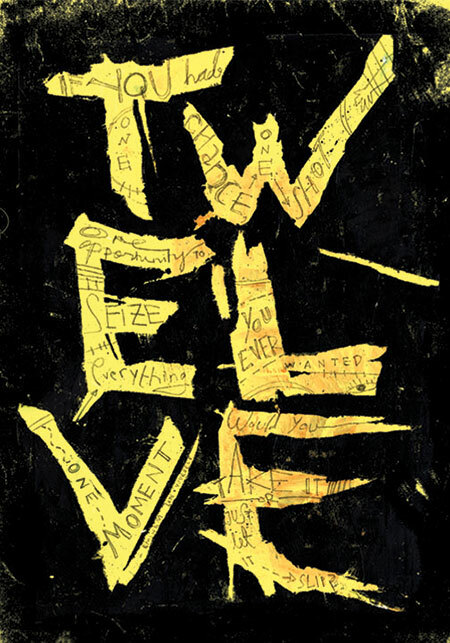 Twelve teaser poster by Prabha Mallya. The stories in Twelve are illustrated by some of the best, yet unknown, artists who are there in India today. The supremely talented Prabha Mallya is our art director and she is doing all the covers for Twelve apart from illustrating and lettering some of the stories. We also have Rajiv Eipe, Aindri Chakraborty, Pia Alize Hazarika, Archana Sreenivasan, Jasjyot Singh Hans on board for the stories, and we’re looking forward to collaborate with some more artists whose work we simply love and hold in the highest regard. In fact, I’m in the process of writing the scripts for them right now. In Twelve, readers can expect a comic series that they have never seen before in India. There are no superheroes, no mythological beings. The characters are all real-world, flesh and blood, young men and women like them. Real people, with their own triumphs and failures, secrets, skeletons in the closet, loves and hates, friends and enemies. People facing momentous choices in their lives—choices that could define their entire future. We’re really excited about Twelve, and we’re looking to bring it out within the next two months. Fingers crossed on that. I think this is the first time I’m talking about Twelve in such detail. Where do you see Manta Ray going in the near future? Are you guys looking at a regular release cycle? Maybe comic book series? Do you have any other releases in the pipeline? We’re a small, independent publisher—that’s the way we started out, that’s how we want to be until we’ve really established ourselves. So, for now, we’re going to concentrate on a few projects that we really believe in. The first of those is Twelve, which is a limited series. We’ve got other projects too in the pipeline, stories which are going to be on the other end of the spectrum from Twelve or Hush. It’s too early to comment on them, except to say that, again, these are projects which are very different from what we’ve seen in comics in India so far, brought to life by some of the best, yet unknown talents here. We’ve also been corresponding with some independent creators who’d like to publish their works with us, and some of these are really interesting projects. The one thing we’re clear about is that we don’t want to do a half-hearted attempt—on our own projects or with independent creator projects. We want to give our 100 per cent and more to everything we do, so even if that means that we have to take things a little slow, we’re okay with that. What, according to you, does it mean for a comic book to do well in India? I can answer this only from Manta Ray’s perspective. Hush, our first book, was our calling card. We wanted to show that we want to tell stories differently, that we want to tell different stories. And readers responded to it too. So we achieved our goal there; for us, Hush did well. Hush, however, wasn’t a commercial project. It wasn’t meant to be, either. In Twelve, we’re still telling different stories and telling them differently too. With Twelve, we also want to go wider in terms of reach, audience, and access. We want more people to read Twelve and discover Manta Ray. We also want Twelve to be commercially successful. If we want to keep telling unique stories, then we have to be able to sustain ourselves too. So our goal for Twelve is not just readership and a positive response, but also commercial viability for the series and for Manta Ray. The three of these are connected. To achieve all of these—that’s our goal for Twelve. Do you have any Famous Last Words for our readers? Keep reading comics! And, share the joy with your friends too!